Do you remember your first day on the job at a new school? Chance are that no matter how helpful your administrators & fellow teachers were, you still had a few moments of confusion. Okay, I’ve got five minutes until I take the kids to lunch. Oh, wait! Where’s the cafeteria? But if, sadly, there was little support for new hires at your school, chance are things didn't go very smoothly at all - and maybe even led to some embarrassing situations. A school's success rests on its teachers, and teachers' successes grows exponentially with a supportive administration. Proverbs 27:23 says, "Know well the condition of your flocks, and give attention to your herds." Like shepherds, school leaders should listen to the needs of their teachers, especially newly-hired teachers, and respond appropriately. In Teach 4 the Heart's Christian Teachers' Lounge, one administrator asked what she could do to serve her new hires better. 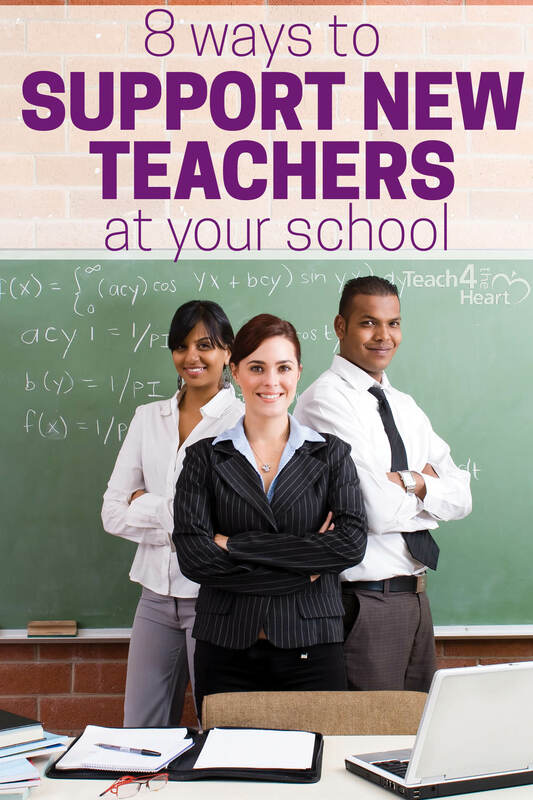 Several suggested ways for administrators to help guide new teachers. Here are some of the top ways teachers want administrators to support them when they start at a new school. So please pass these on to your administrator. And if you’re a teacher who knows the ropes of your school, you can use these tips yourself to help mentor & guide your new coworkers. Many teachers testified to how invaluable a mentor teacher was to them in their first year at a new school. There's no way I could have survived my first year of teaching without a mentor. She took me on a tour of the building. She showed me the ropes of what teaching at our school looked like—how we did lesson plans, how to put in for a sub, and how to survive junior business day (don't ask...). My mentor reminded me of upcoming meetings and due dates, gave advice on how to handle discipline issues, and filled me in on who's who at our school. Most importantly, she was there when I had questions, guiding me and motivating me to press on. If your school doesn't have an official mentor program, encourage your administrator to start one. Or, appoint yourself as an unofficial mentor to one of the new teachers at your school. Teachers face a myriad of issues throughout the school year. Without clear expectations, teachers might mishandle records, skip over lesson plan procedures, and mismanage submissions into the online grade book. Administrators and/or mentor teachers can help teachers avoid such issues is by providing each new hire with a faculty handbook or welcome packet. Let new hires know things like how they prefer to communicate with teachers: email, text, in person? Teachers need to know how they are expected to handle discipline issues, attendance, and lunch counts. What about sending students out of the classroom? Do they need a pass? What's fair game to take from the supply room? Can we wear jeans on Friday? All these and more are things that teachers need to know right away. And if you don't have a system for communicating this information, you can't reasonably expect they'll somehow just figure it out on their own. One teacher described a scenario where she was the only teacher in her school that didn't have a treat ready for her students on orientation day. No one told her about the tradition. Administrators (or mentor teachers) can provide a schedule of traditions to help new hires keep up with what's going on. Teachers' loads grow heavier around the holidays. If an administration requires all classes to complete an art project to help decorate the cafeteria for the annual community Thanksgiving dinner, it's best to let teachers know well in advance. Having a principal come by your class is nerve-wracking. Oh no! Why is she here? Why does she have her clipboard? Why does she have her clipboard, her pen, and her laptop? Ease teachers' minds by first visiting their classrooms as supporters, not evaluators. New hires are learning the ropes of a school. They need guidance. Effective teachers exude peace. Administrators who make positive, supportive visits to classrooms will build their teachers' confidence and things will go much more smoothly when it's time for evaluations. If you take specific care to have edifying discussions with their new hires, you will create an environment of effective collaboration. New teachers feel welcomed when they know they are free to ask questions. Communication is essential. For new teachers, being in an environment where professional interactions are valued is empowering. A day before everyone else shows up, host a new teacher training. At this meeting, new hires can meet one another. From there, those teachers can cultivate relationships and succeed together. Cover topics pertinent to new teachers: bell schedules, insurance options, duty dates, school calendars, and pay days - things that the rest of the staff doesn't need to review but that are essential for new hires. Time is a teacher's most precious resource. Teachers feel valued and appreciated by their administrations when meetings go as planned. But when they start late - or (much worse) end late, this communicates a disregard for them & their time. Meetings must also serve a distinct purpose. Teachers should know why they are sacrificing their conference period to attend a meeting. Make sure you provide context at meetings for new hires. Avoid comments like 'it will be just like last time.'" "Last time" and "last year" won't help new teachers. Well-planned, purposeful meetings keep teachers in the loop and strengthen them in their professional roles. Help new hires prepare for their class well before the first day of school. No matter their experience level, new hires will experience a learning curve as they figure out their new campus. For those teachers assigned to inclusion classes, receiving a stack of Individualized Education Programs (IEPs) to implement is a tall order. Then there are students with 504 plans and medical issues. Communicating these need to a teacher early will help them better prepare their classrooms for their students. The earlier you can provide access to their classrooms, rosters, schedules, etc. the more confident and prepared your new teachers will feel come day 1.